Thanks to your support, Romwe are becoming more and more popular after reforming again and again. There is budget left this month so we decide to hold a brand new giveaway to express our appreciation to our lovely fans. Would you please leave a comment below this post with your email address that you registered on Romwe? We will choose a lucky winner by random.org and send $80 freebies. Don’t become disappointed if you are not the lucky winner. We provide some inner coupons for you. You will get discount and get items you love with less money. The giveaway will end on 7th Nov,2011. Good luck to you!! Please share the GIVEAWAY with your friends and enjoy! Oh I have to enter this giveaway! 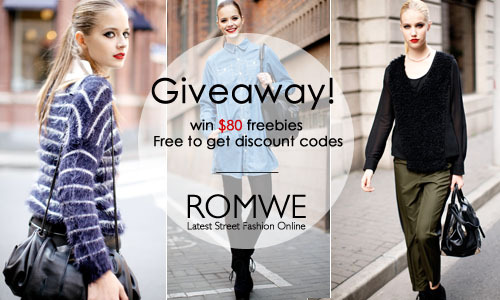 Love this giveaway, because Romwe is one of my favourite online shops!! I would have to use it on a handbag. Romwe has the coolest selection of handbags. thanks for the giveaway! I hope we have more in the future! Quero agradecer pela visita e comentário no meu blog. Estou muito feliz, volte sempre! Adorei este esapço fashion e já estou seguindo! I just placed my first order and Im super excited about your site! Would love to get more pieces, thank you for this wonderful giveaway! super excited! such an amazing opportunity!! thanks for the giveaway <3! Waaah, what a cool giveaway! Thanks for the opportunity! Guapisima...muchas gracias por comentar en mi blog. Te sigo! tu blog y tu estilo me parecen genial. Por cierto tengo nuevo post en mi blog, me encantaria que me dieses tu opinion.